Apple’s iPhone 6 pre-orders go live tonight at midnight PDT/3AM EDT, and thankfully Canada is included. Here’s a quick guide we’ve put together with some of the most popular questions asked by you guys, answered to the best of our knowledge. Why pre-order the iPhone 6? Can’t I just buy it in store? Pre-ordering essentially guarantees you’ll get the phone on launch day, but it depends on which route you take. Pre-order an unlocked iPhone 6 from Apple and you get your phone delivered on Sept. 19 for major urban areas. Pop in your existing nano SIM card and you continue on with your cellphone plan as normal. Pre-order from Rogers, Telus and Bell and it’s basically a reservation system that’s first come, first serve based on the number of units they receive. Once you sign a contract or renew, you’ll most likely need to meet the minimum monthly plan requirement for a 2-year iPhone subsidy, which is $80/month from Rogers. What time does Apple’s pre-order start? Online pre-orders from Apple.ca start at 12:01AM PDT/3AM EDT, Friday, September 12. That’s tonight. How much will an unlocked iPhone 6 from Apple cost? What’s the limit on iPhone 6 orders? You can order 2 of each iPhone 6 model (i.e. 2 x iPhone 6 and 2 x iPhone 6 Plus), a max of four iPhones per person. What’s the best way to pre-order an unlocked iPhone from Apple.ca? Use the Apple Store iOS app. It has proved to be faster and more reliable than ordering on the web. Just make sure you payment credentials are filled in NOW, and before the online store goes offline later tonight, to ensure you’re ready to go when the clock hits midnight PDT. If you’re ordering via the web, enable Express Check out now. Online pre-orders are live, but they aren’t working. Here’s a trick to get it to work via the iPad and iPhone. What’s the Reserve and Pickup option from Apple? You get to reserve an iPhone 6 tonight, which will be ready for you in-store for pickup. They will contact you for a pick up time. You should be able to choose an unlocked phone or one on contract. Click here to track reservations stock in real-time. Will I have to wait in a regular line up for Reserve and Pickup? No. The Apple Store at Oakridge told us there will be two lines: one for reserve and pickup and another one for the general public. It will be busy so be prepared. Will I be charged right away online for Reserve and Pickup? No. You will be charged in store. Apple will send you an email once your iPhone 6 is ready to be picked up on Sept. 19. Of course, online quantities will vary for this first pickup date and it’s first come, first served for online reservations. When is the actual iPhone 6 launch? Apple will launch the iPhone 6 on Friday, September 19. Stores will open at 8AM local time. When will my iPhone 6 order arrive? 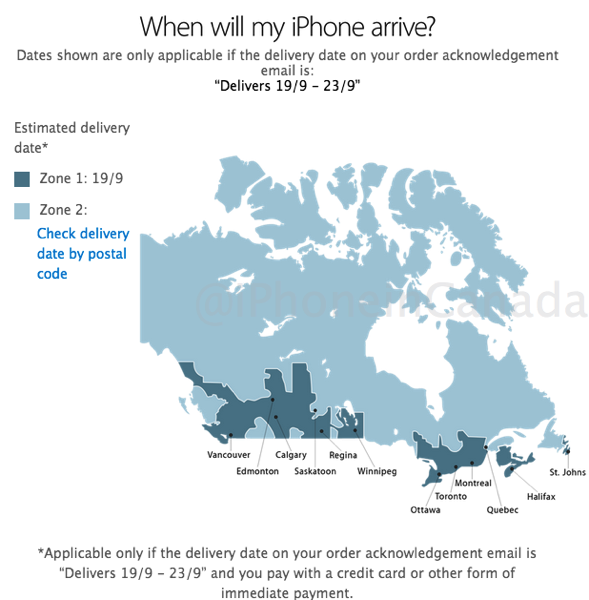 According to Apple’s updated iPhone map, those living in Zone 1 (major urban centres) will have an estimated delivery date of September 19. Do note in all of our previous Apple pre-orders, we have always received shipments on launch days (Vancouver and Victoria). To get to this map, add an iPhone to your cart online and a link during checkout will show you this map. Or check your delivery date via postal code here. What is Apple’s iPhone return policy? 15 calendar days to return for a full refund. Either visit an Apple Store or call customer service to get a prepaid return label. What about pre-orders from Rogers, Telus and Bell? What time will they start? Rogers: Update: Rogers reservations are now live. Go to rogers.ca/reserve. Also, reservations could qualify for a free Bluetooth Speaker. Virgin Mobile: pre-orders now live. SaskTel: Pre-orders now live, one reservation per wireless number; Update–now closed. iPhone 6 pre-order is now closed. Visit a SaskTel Store or SaskTel Authorized iPhone Dealer starting Sept 19. Quantities are limited. MTS: Pre-orders now live, launch on Sept. 19. Also new plans. Videotron: iPhone 6 pre-orders on Sept. 19, launch on Sept. 26. What’s the 2-year term pricing for the iPhone 6 models? You will be required to pay a minimum $80/month to get a full iPhone 6 subsidy on Rogers and Bell. Telus customers require a minimum $70/month plan, while Fido customers with grandfathered plans can qualify with a minimum $60/month (voice + data) spend. 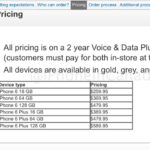 Where else can I pre-order my Rogers, Telus or Bell iPhone 6? Costco Wireless Kiosks: taking unofficial pre-orders by jotting down names on paper, according to the Guelph location we spoke with on the phone. What’s cheaper? An unlocked iPhone 6 from Apple or paying a contract with Rogers, Telus or Bell? Even with higher unlocked iPhone 6 prices this time around, it’s still cheaper than paying a 2-year contract, but there are exceptions. If you bring your own device, most carriers offer 10% off your monthly bill. Check out our post: Rogers vs Bell vs Telus vs SaskTel vs MTS vs Videotron iPhone 6 contracts. 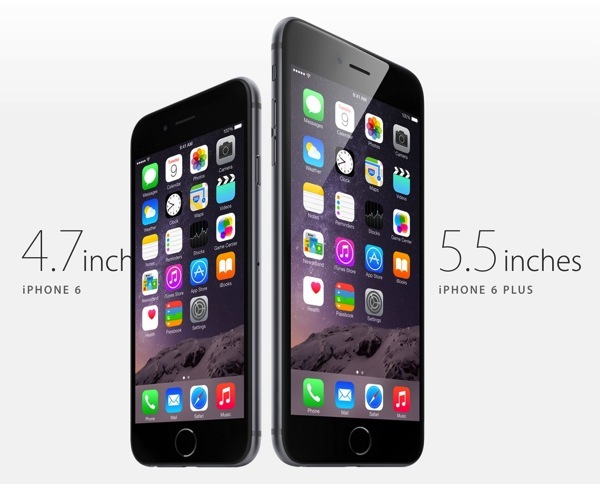 Should I buy an iPhone 6 or iPhone 6 Plus? Check out our poll and hands-on with cardboard cutouts. Hipsters and skinny jeans, beware of the iPhone 6 Plus. But don’t worry, your man-purse will keep you covered! Follow us on Twitter as we’ll be sending out updates if anything changes. If you’re on EDT, remember to set your alarm not for 3AM, but rather 10 minutes before so you have lots of time to prepare. Same goes for PDT. Check out our iPhone 6 and Apple Watch roundup page to learn more about the devices. Feel free to share this with friends and family on Twitter, the Facebook, and more. Did we miss anything? Let us know in the comments! We’ll continue to keep this post updated. PS – Don’t forget to enter to win an iPhone 6 here from our partners at StackSocial!